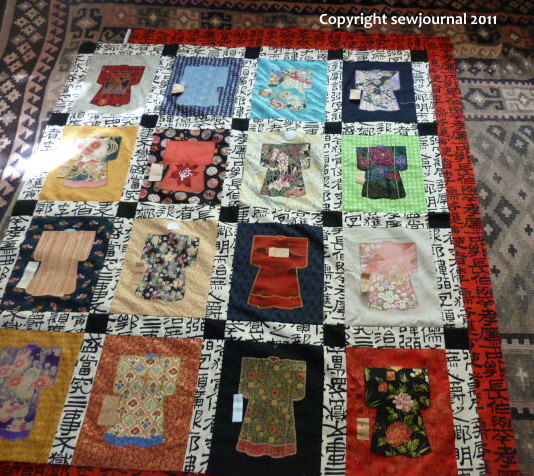 Thank you all for your input on the subject of a border for the Kimono Quilt. I have tried the red Kanji as Julie suggested. I had dismissed it originally as I thought it was the wrong red for the front. Now I’m not so sure. Here’s a photo so you can judge for yourselves. Is it too busy? I think straight black is a problem as it will merge with the cornerstones. But I agree that the one I tried is too busy next to that sashing. Of course I could go for my usual option of no border at all. I’m not really a big fan of plain fabric borders. I don’t mind pieced or appliqued borders but just fabric always makes me think that the quilt wasn’t as large as the maker wanted it to be and so they added a border to make it larger. Sorry – please don’t yell, that’s just what occurs to me when I see one. The first quilt I made had two just fabric borders and I really don’t like them. I feel that they actually spoil what was quite a nice quilt before the borders were added. Do you like looking at other people’s houses? 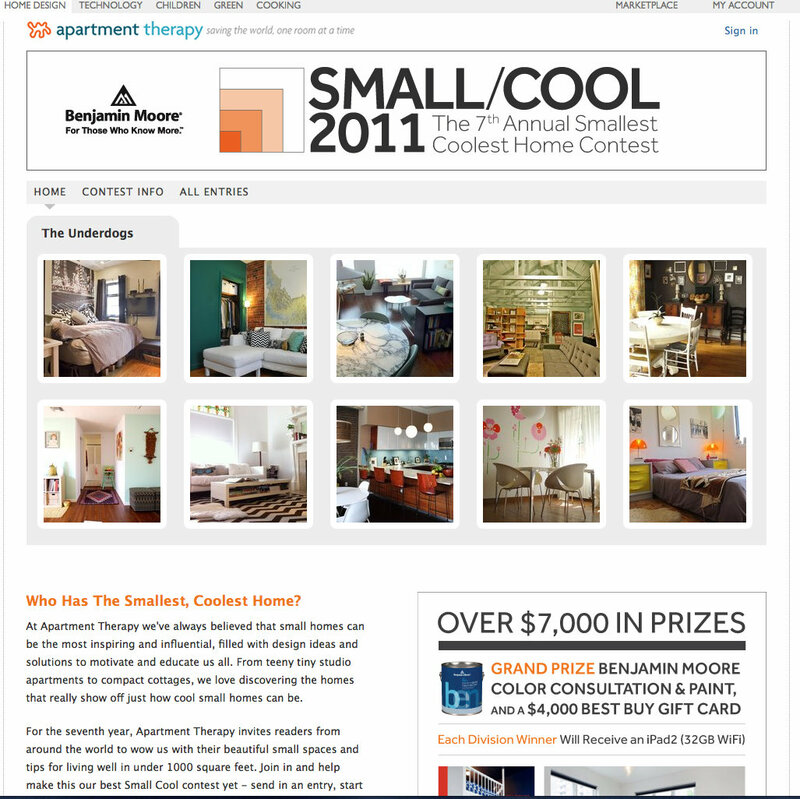 I came across the website of the 7th Annual Smallest, Coolest Apartment Competition, by accident today. There are some really lovely small apartments. Here are links to three of my favorites. A lovely sloping roofed loft apartment. A beautiful A-frame house in what looks like a stunning setting. And a quirky, eclectically furnished apartment in LA. I like the red Kanji! Ok, I’m going to be different and say the red border IS too busy. It’s a beautiful fabric, but it’s such a deep, intense color that it takes away from the lovely kimonos you’ve created, and I’m guessing you want those to be the quilt’s focus. I think you could have a simple black border (the same fabric as the border squares) and it would still stop the eye without detracting from the kimonos. Hi Munaiba, I’ve been thinking about how nice it would be to live in a small space. So much less housework but then where would I put my fabric? I was eager to see the A Frame because there are many here in snow country. Then I saw the location…practically next door! Thanks for the link. I think everyone likes to peep that’s why house tours are such successful fund raisers! I like the red too! I admit that when I suggested solid black, I forgot about the corner stones. Still…try a tiny black border (about an inch) before the red kanji and see what happens…not actually sewn, but just a peek! I am pretty sure the red is perfect! Isn’t it fun to put thought into what we are doing? Thanks for asking for input — thrills me! Maybe an outer border in a dark fabric to match the cornerstones. I do like that touch of the red. Since I am always limited by what I have on hand, it’s fun to play with other people’s stashes. I love the red border but I don’t agree with you on plain fabric borders. 🙂 It gives you the opportunity to show case your hand quilting, and this top is begging for shasiko… I hope I spelled that right. With your signature large quilting… well it is just perfect IMHO!